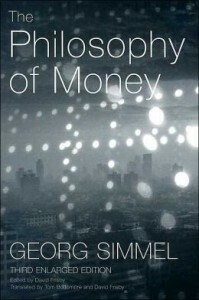 Simmel’s philosophy of money is an underappreciated classic that explores society’s relationship to money. The title reads like it might be more of a metaphysical work, the text explores the wider implications of accumulating wealth and how people interact with money on a day to day basis. Simmel begins by setting the argument that money is a form of social interaction. Barter is a good example of how social signals can contribute to a situation. Bartering one object for another is a personal experience, but money is impersonal. Money helps society maintain a sense of rationalism in this way, thus advancing modern society. Money can even replace personal ties, in the case of business partners where a friendship may develop but the relationship is based on business interests. Money has a unique effect on social structures as well, argues Simmel. Money can create or dissolve social bonds, based on voluntary interactions. Consider what would happen if someone in your circle of friends suddenly won the lottery or launched a successful company. How your social structures might alter, how allegiances may change. It’s common to hear lotto winners suddenly finding long lost relatives and estranged parents. Which means that money is a measure of one’s sense of rationality in many ways. This behavior seems greedy on the surface, but this kind of greed is motivated by an impulse to survive. Not all of these ideas lead to positives. Greed is a terrible side of humanity that can cause people to do impulsive and hurtful things. Yet, Simmel’s examination of money and its impact on society helps us come to terms with what money may mean to us.